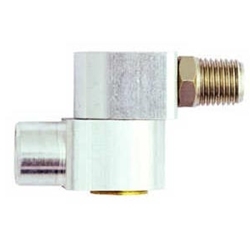 Milton Air Hose 1/4" Swivel Connector BOWES MIL S657. Attach portable air tools to air hose. 360° swivel in two places prevents hose kinking, and keeps the hose out of the way. Female pipe threads connect to most hose fittings and adapters. Not for use with percussion tools.